I have a lot of files that I’ve made for various reasons and never posted. I thought I would try to find some and post them. 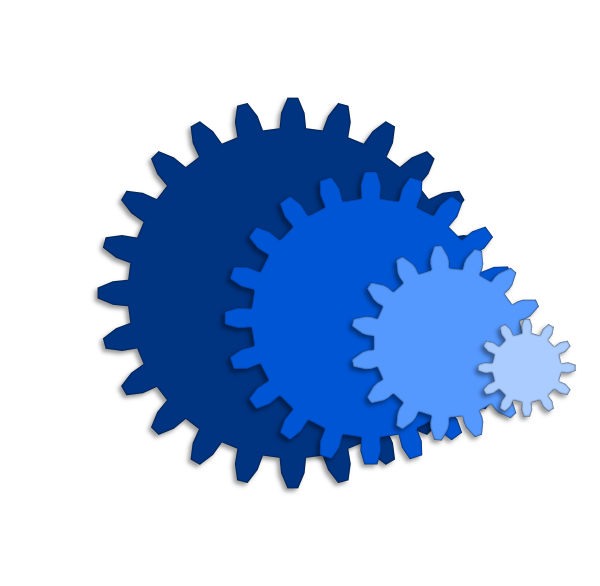 This set of gears was something that I was playing with in Inkscape and never posted (they weren’t even in the right file location on my computer) so I thought that I would share them. The download is a layered svg file for use with any version of SCAL. This entry was posted on Saturday, January 12th, 2013 at 10:45 pm and is filed under SCAL, SVG Files. You can follow any responses to this entry through the RSS 2.0 feed. You can leave a response, or trackback from your own site. These are perfect!! My husband has a lath all torn apart and it has a lot of gears. Your timing is amazing!! Thanks for the file. Thank you very much…I’ve been thinking about some robot cards, so these gears will be perfect. Do your svgs work with the Apple Computer Heather, because I have not been able to download for a time now. Did you try to download the gears file? If that worked for you then I will try switching back to MediaFire for my file hosting. Just found your site and love it! Thanks for sharing!! Not sure how I’ll use them but I like them…going to work them into a masculine card or layout. Thanks for sharing the gears with us. I love your presents Heather, but this one I do not seem to be able to download. I have been following you for a few years now and I wonder have you ever asked for donations for your work? I certainly think it’s time for me to how can I do that. Merci est il possible d’avoir les fichiers pour silhouette studio,? J’aime beaucoup ces modèles.Merci encore pour le partage. I’m glad that you like my files. I will try saving the gears as DXF, but since I don’t have a Silhouette there is no way for me to test how they work. Thanks for sharing the great cut file. Thank you so much. It will be fun to try making a card with the gear files.